1) Printed Matter’s NY Art Book Fair 2016 – Printmaker Chang Yuchen, artist Huang Hai-Hsin, and Taiwanese indie publisher nos:books will be exhibiting at the book fair. 2) Manufracture Series: Bread, Steel, and Benjamin Moore – Artist Jia-Jen Lin (林嘉贞) continues to investigate the segregated yet inseparable relationships between manufacturing and artmaking within local settings in Brooklyn. Through collaboration with an Italian bakery in Bensonhurst, a Chinese steel fabrication shop in Sunset Park, and an artist and interior painter working in Brooklyn, she attempts to re-fabricate the boundaries and to create an overlap between artmaking, which is conventionally considered sublimated and bound to aesthetic principles, and manufacturing, the processes of which are seldom seen. Free, but currently full. Contact the organizer for availability. 4) Circle Line Cruise – Mid-Autumn Moon Festival – Searching for a place to experience the Mid-Autumn Festival? Curious about how New Yorkers celebrate this Asian cultural event? Nothing quite compares to a harbor lights cruise with a chance to enjoy the full moon along with live traditional Chinese music, tasty mooncakes, and new friends! In Chinese lore, Chang’e saved her husband from treachery and became immortal herself. She was given a magic elixir and flew so high that she reached the moon, where she has lived ever since. Since then, people have been celebrating the Moon Festival by gathering with family, eating mooncakes, drinking, tea and watching the moon rise. Experience the beauty of NYC’s evening skyline while enjoying the festive atmosphere onboard. Enjoy traditional Chinese music performances and snack on mooncakes and tea. 5) Reunification – Alvin Tsang’s award-winning film (Special Jury Prize at SDAFF) gives an insider view on the contemporary Asian American immigrant experience, divorce and family psychology, and personal filmmaking. The filmmaker reflects on his family’s migration from Hong Kong to Los Angeles in the early 1980s – fraught with betrayal from his parents’ divorce, economic strife and communication meltdown between parents and children. This poetic exploration of many unresolved years moves moodily across different channels and modes, bending into labor histories and Hong Kong’s colonial trajectories. Tsang turns the camera on his own family, cautiously prodding for answers, but fully acknowledging that the only closure he can get will be from deciding for himself how to move on. Followed by a Q&A with the director. Part of the “Chinese in America” Film Series. 6) From Home to a New Homeland — A Fabled Family’s Faith, Fortitude, Foresight and Philanthropy – In celebration of the 90th anniversary of the founding of China Institute, the Renwen Society of China Institute will present a special program honoring Dr. James Si-Cheng Chao with Renwen’s first Lifetime Achievement Award for Philanthropy. Joining him at the event will be his daughters, the Honorable Elaine Chao and May Chao. They will share with the audience their family’s immigrant experiences in overcoming challenges to advance in this country through education, faith, diligence, optimism, and contribution to society. 7) Modern Sky Festival NYC 2016 – China’s Modern Sky Festival returns to New York City, this year to Governors Island with 马頔 Ma Di (performing his famous hit song 南山南 (“Nan Shan Nan”), 苏阳 Su Yang , 夜叉 Yaksa, Chinese hip hop royalty DJ Wordy, and rising bands The Mystery Lights, Navy Gangs, and Breanna Barbara. Refer to our latest article about the festival for more details! 8) Annie Chen Trio – Jazz singer Annie Chen performs with saxophonist Xinlu Chen and guitarist Marius Duboule. 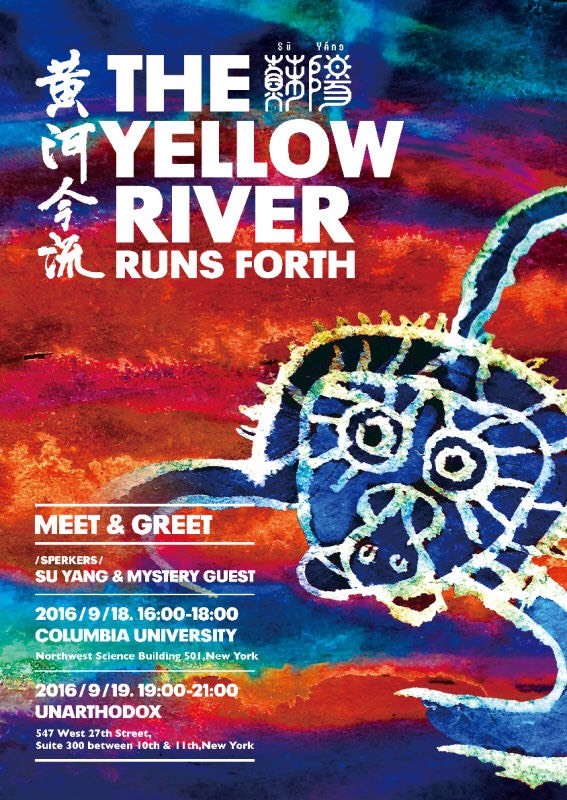 9) The Yellow River Runs Forth – Northwest Chinese singer Su Yang, who performs at this Modern Sky Festival holds meet and greets and lectures about music from Shaanxi and the musical traditions along the Yellow River . Unarthodox, Suite 300, 547 W. 27th St.
10) Taiwan Excellence NY Product Showcase 2016 – Featuring over 50 award-winning products from Taiwan’s leading innovation brands, the event will allow visitors to experience some of the latest technological breakthroughs across a range of different categories including gaming computers, smart accessories, alternative transportation and sustainability. Singers from the local Taiwanese theater community will perform Mandarin and Taiwanese folk songs. 11) Cultural Revolution, Propaganda Art, and Historical Memories – Opening a two-month exhibition that showcases the C.V. Starr East Asian Library’s Cultural Revolution collection is a rare screening of the film China – The Red Sons: Inside China During the Cultural Revolution in 1968 filmed by Australian filmmaker Roger Whittaker during a trip to China in 1968 organized by the Australian Union of University Students, introduced by Professor Ying Qian of Columbia University who will also hold a Q&A afterwards and the lecture “Performing the Cultural Revolution: Loyalty, Violence, and Dissent” by University of Pennsylvania Professor Guobin Yang. 12) Access Denied: Foreign Journalists in China – PEN America launches its new report examining how the foreign press faces unprecedented restrictions on their freedom to work in China, the world’s most populous country. Opens at AMC Empire 25 on September 16. 2) Caught – In this irreverent new genre-bending piece, theatre makers Christopher Chen and LeeSunday Evans apply their playful imaginations to the work of a Chinese dissident artist. Their hybrid work invites you to navigate a labyrinthine trail between truth and perception, authority and authenticity, illusionary art and real jeopardy. 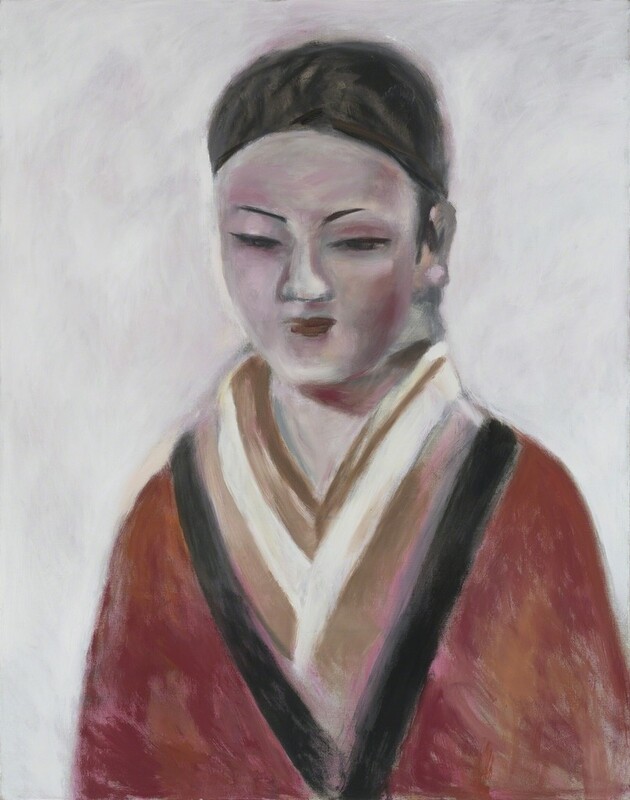 1) Gang Zhao (Jack Tilton Gallery, 9/13 – 10/22) – Jack Tilton Gallery in the Upper East Side presents works by Gang Zhao, who was an early participant in the controversial avant-garde Stars Group that showed in Beijing in the 1970s when the artist was still less than twenty years old. Educated in Holland and the United States, Zhao’s work combines both Eastern and Western influences and encompasses elements and sensibilities from both worlds to explore his world view. Zhao has continued to paint increasingly poignant figurative works that are at once lyrical and based on intellectual roots. 2) The School of Visual Arts – The Book Show (SVA Gramercy Gallery, 9/16 – 9/29) – School of Visual Arts presents “The Book Show,” an exhibition of work by members of the MFA Illustration as Visual Essay class of 2017. “The Book Show” challenges students to conceive, write and illustrate a book—whether a children’s book, graphic or illustrated novel, or visual essay—based on a personal experience or subject matter that is meaningful to them. Amber Ma, who we featured earlier, will be in the show with Jin Xiaojing, Helen Li, Wenkai Mao. and others. Amber Ma, OOPS! SUMMER WAR!! 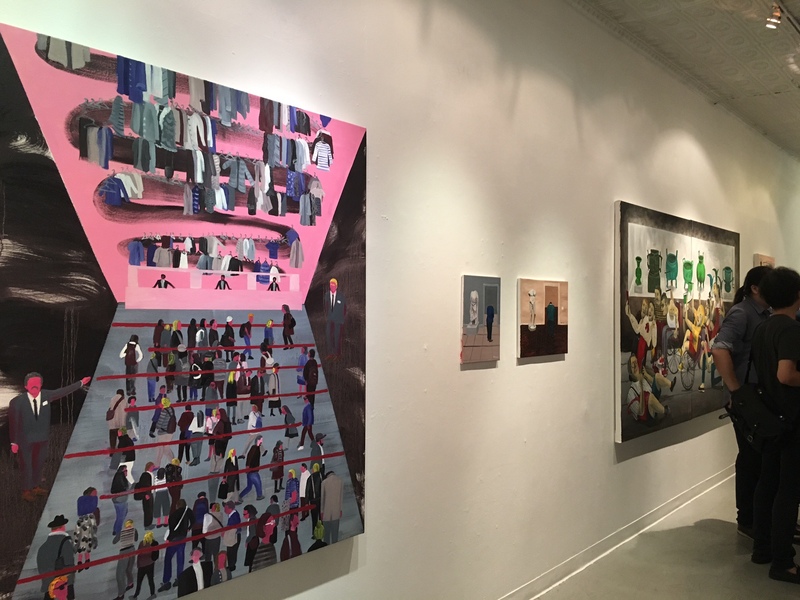 3) Jacky Tsai – Culture Clash (208 Bowery, 9/22 – 10/2) – This exhibition a continuation of Tsai’s exploration of a visual dialogue between traditional Eastern craft and Western pop art. In the new works for the exhibition, imagined scenes filled with symbolism and references are constructed in order to visually tell Tsai’s desired narratives, which can have historical, political, environmental and sometimes humorous connotations. The Hangover, for example, a large hand-carved lacquer work made in China, depicts a smiling Superman, indulgently reclining in an Eastern hotel room, surrounded by empty wine bottles, takeaway boxes and doting girls. In the limited edition screenprint Puppets, Tsai plays with the idea of power, strength and control as a Chinese general performs a string puppet show in an Eastern theatre, where the characters are Western superheroes. 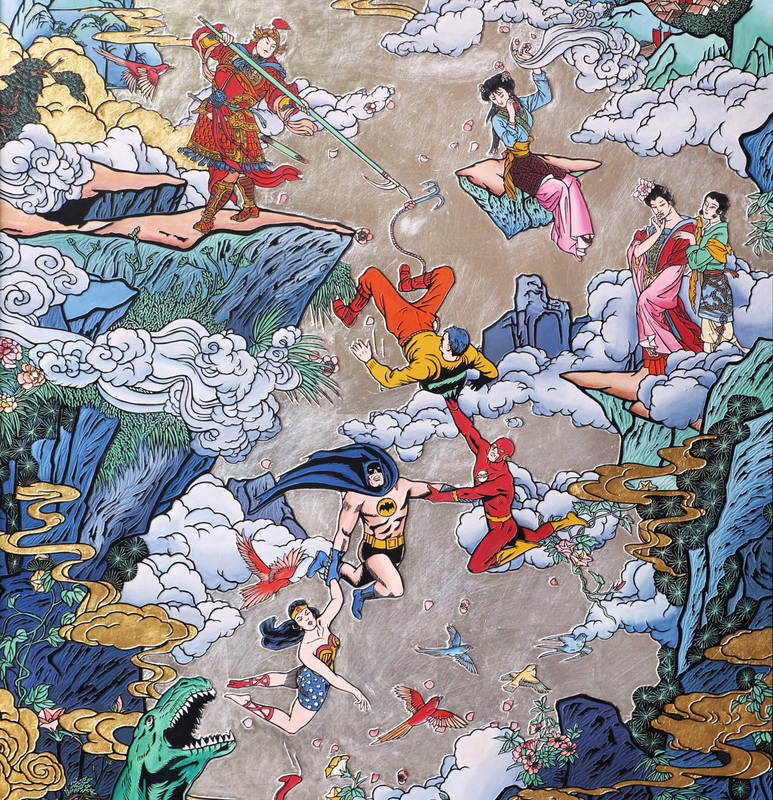 More comic book characters such as Batman and Wonder Woman appear in other works, and the porcelain piece Plum Play portrays Star Wars storm troopers fishing for mermaids. In the lacquer carving The Last Chinese Tiger, Tsai confronts environmental issues, and a percentage of the sale of this piece will go to the Save Wild Tigers charity. The exhibition of unique pieces will include hand-crafted lacquer carvings, painted porcelain, embroidered silk, paint on canvas and eight limited screenprint editions. Installation view, Huang Hai Hsin, “The Museum Show,” Gallery 456. Photo by Hansi Liao.